Karina's Kreations: Matchbox Thank You! This cute little box is made with the Stampin'Up Matchbox Bigz XL die and the Big Shot die cut machine. 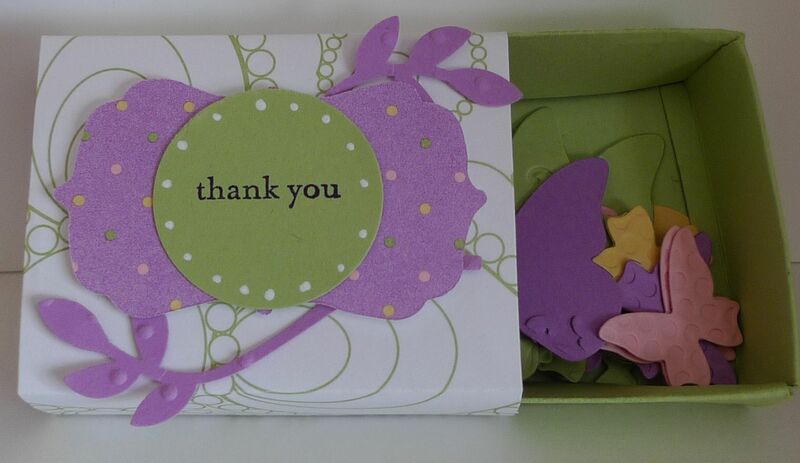 I used Orchid Opulence, Certainly Celery and the beautiful Shades of Spring designer series paper to make the box. The leaves are made with the Extra Large two-step bird punch. The greeting is from Happy Moments stamp set which was stamped on Certainly Celery card stock and punched out with the 1-1/4" circle punch. I added some white dots with the Signo White Gel Pen. The box was filled with butterflies made with the Stampin' Up Beautiful Wings Embosslit die. This makes a cute little Thank You gift. If you sign up to be a demonstrator, you will get 30% off your first order. This would be a great time to a buy a Big Shot die cut machine. The starter kit is on sale until March 31. It's only $225.00 and that includes shipping and Gst. Just click join now for for information.